Mobile game project using GPS to manipulate music in real time. Created by Antonin Fourneau. Ato’s OTERP experimental and sonic psp game will be presented in june at the cube festival, Issy-les-Moulineaux, France. Ato will present a much more improved version of OTERP and I will do more sound for it. Ato, a.k.a Antonin Fourneau, created OTERP and presented it at the Digital Art Festival, 6-11 dec in Tokyo at Shibuya Tokyo Wonder Site. 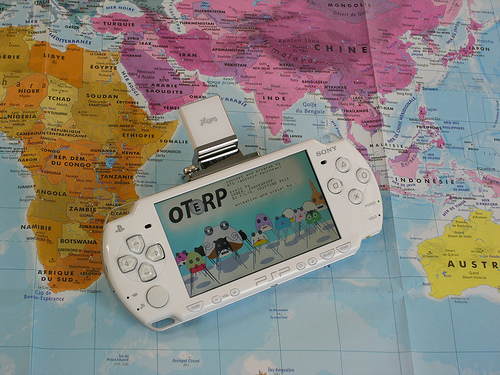 OTERP is a psp game using a magnetic compass. 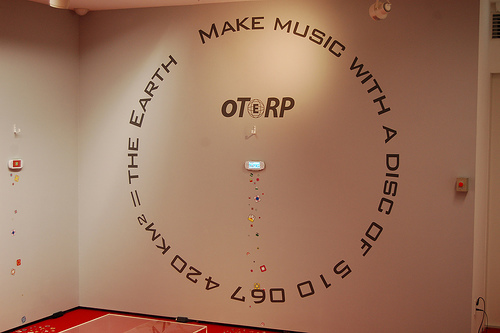 The game plays/mix differents music loops and sounds depending on your latitude and longitude. Ato made a few side-projects ( cardinal turntable ) related to this main concept of mobility, music and spatial interface. Ato ask a few sound artists ( including me ) to created or let some loops and sounds. The project is at its first version but is already giving a great experience.